Triathlons are great events to get your kids involved in because they include all three activities! Triathlons geared toward kids are gaining in popularity and have many health benefits—both mentally and physically for your children. What is ‘Tri a Tri’? This is a FUN EVENT aimed at giving children a chance to ‘Tri a Tri’ triathlon which involves a 250m open water swim followed by a 5500m cycle and finishing with a 1000m run. The event is being ran at Craigavon Watersports Centre as part of the Sport Northern Ireland Everybody Active 2020 project. This event is an ideal way to encourage children to get active & healthy and burn off lots of calories. Who are the event for? This event is for children aged 9 – 15yrs old who can swim 250m in open water without stopping (which could be as tiring as a 500m pool swim). With the event takes place in Craigavon City park with the bike ride and the run taking place on the tarmac off road path making it easy and very safe. 18:15 – 18:30 Set up transition area. Registration will take place between 6.00pm and 6.15pm in Craigavon Watersports Centre. All competitors must register prior to the safety briefing. If you require a wetsuit please request one during sign on. The transition area will be at the front of the Watersports Centre building. This will be open from 6pm on the evening. Entry will only be permitted to those racing with one adult in order to keep the transition area clear. Bikes and helmets will be visually checked for obvious defects but the responsibility for roadworthiness remains solely with the competitor. Rack bike and equipment box (towel, cycling shoes, running shoes etc neatly and safely in allocated location. Within the transition area, only race equipment will be allowed at your bike racking position. Please ensure you do not leave any valuables around. Craigavon Watersports Centre does not accept responsibility for lost, stolen or damaged belongings. The bike out and Run out will be clearly marked. Please familiarise yourself with these upon arrival. There will be a race briefing for all competitors at the lake side at 6.45pm. It is essential that ALL competitors attend this briefing. A reminder will also be provided regarding race rules. The race will commence at 7pm. The swim course will take place in two waves. All competitors will be allocated to a wave depending on their age group. The swim will start in the water and the start position will be marked on the day. You must not go beyond this marker until the race has started. Wetsuits must be worn and it is compulsory to wear a bright colour hat. If you get into difficulty during the swim, you should try and remain calm, roll onto your back and raise an arm. A kayaker will approach you and ask you to take hold of one end of the craft. Please do not try to hold the centre of the kayak. We will have experienced kayakers providing safety cover. Safety floats can be worn during the swim. If this is your first triathlon or you are a less confident swimmer, stay towards the back the group. The swim exit will be at the slipway. Wetsuits may be removed as far as the waist during the run from the swim exit to the transition. 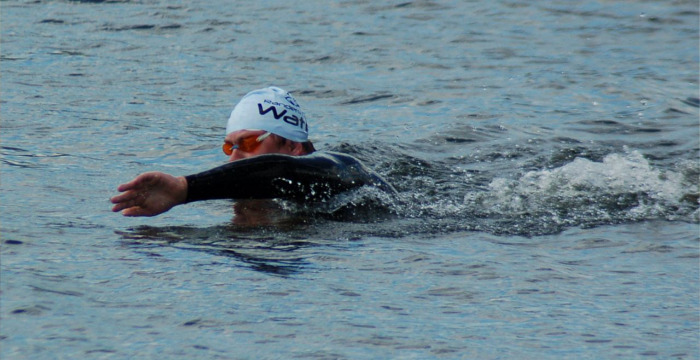 When in transition please make sure to put your wetsuit, hat and goggles into your box without impeding others. Ensure that your helmet is on and securely fastened and trainer on fully before removing your bike from the racking. Cycling is not allowed in the transition area. You may only mount your bike once you have crossed the mount line which will be marked on the day. The cycle will take place in Craigavon City Park (off road) on tarmac paths and will have marshals at key locations throughout. It will consist of two laps of the course. Helmets must be worn at all times by cyclists on the course. The bike course will still be open to the public walking etc but there will be plenty of warning signs that a triathlon is taking place on the evening. Please respect the public out on the course. When returning from the bike route you will approach the dismount area again before entering transition. You must get off your bike before reaching the dismount line which will be clearly marked on the day. Please ensure that your bike is safely racked before opening or removing your helmet. You will exit through the run out area to start the run leg. The run will take out and back on the same route with the turning point clearly identified by a marshal. Please keep to the right at all times. The finish line will be at the back of the Watersports Centre building so don’t stop until you are over the line. Prize giving will be at approximately 8pm. Prizes will be awarded to first, second and third in each age category with spot prizes for others.